The personal computing (PC) market is a source of concern for most of the established consumer electronics vendors, where chromebooks and 2-in-1 tablet devices seem to be the only bright spots for an upside. That being said, this is an opportune time for someone to introduce a breakthrough product concept. Meanwhile, the downward slide continues. 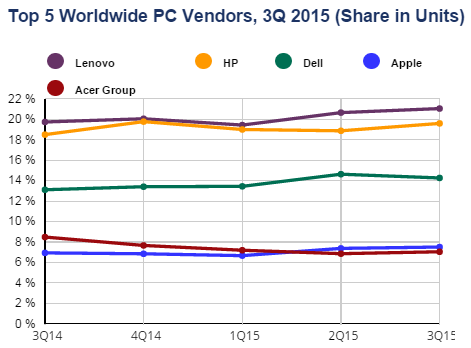 Worldwide PC shipments totaled nearly 71 million units in the third quarter of 2015 (3Q15), according to the latest worldwide market study by International Data Corporation (IDC). This volume represented a year-on-year decline of -10.8 percent -- that's slightly worse than projections for a decline of -9.2 percent. Across many regions, the PC channel remained focused on clearing out the old Windows 8 inventory, before a more complete portfolio of models incorporating Windows 10 and Intel Skylake processors comes on the scene. While Windows 10 has generally received favorable reviews and raised consumer interest in PCs, IDC believes that many users opted to upgrade existing PCs rather than purchase new hardware. In addition, the unusually short time between Windows RTM (release to manufacturing) and the official retail release hampered the ability of OEMs to launch certified new models, resulting in a limited selection of Windows 10 PCs through much of the third quarter. Although the overall market continued to see double-digit declines, and even the top vendors saw shipments decline from a year ago -- the top 4 vendors performed much better than the rest of the market. But that's not an outcome that any would be proud to claim as an accomplishment. Collectively, the top 4 vendors saw shipments fall by -4.5 percent from a year ago, compared to a decline of almost -20 percent for the rest of the market. "The PC market continues to contract as expected, but we remain optimistic about future shipments," said Jay Chou, research manager at IDC. 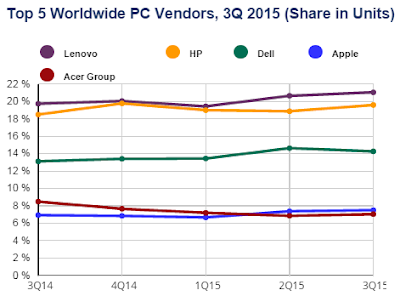 The U.S. PC market continued to suffer from soft demand in both the consumer and enterprise segments. The July launch of Windows 10 had an immediate impact, as many consumers took advantage of the free upgrade. In the enterprise, IT budgets remained focused on other more important projects -- including enterprise mobility readiness and digital transformation initiatives. "Still, there is some hope in the fourth quarter," said Linn Huang, research director at IDC. "New designs running Windows 10 and powered by Intel's new Skylake processors are coming to market and may represent the most compelling reason we've had in years for consumers to upgrade their PCs. Whether this compulsion translates into actual sales remains to be seen." Let's be honest, this market is primed for a major disruption. Someone (yet to be determined) must break the status-quo malaise that's prevailed in the PC sector for far too long. Here's the reality: "hope" is not a viable market development strategy. The apparent problem in the PC market stems from a fundamental lack of innovation. With few exceptions, all the latest me-too products just don't offer anything that's remarkable. It's also why reviewing new PC product introductions has to be one of the most uninspiring tasks for industry analysts and tech journalists.